TOGAF is a leading enterprise architecture framework used by EA specialists the world over. While it has been around for nearly 25 years, it has also been updated a number of times by a team of hundreds of experienced enterprise architects, keeping the framework fresh, relevant and fully able to accommodate the ever-evolving worlds of business and technology. 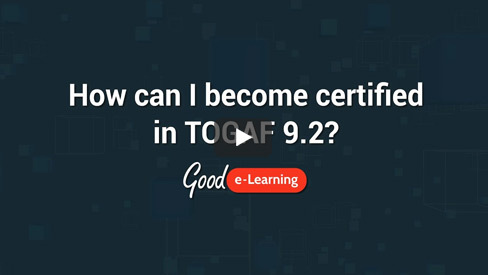 In this video, Mike from Good e-Learning discusses our TOGAF Foundation course. Not only does the course provide an excellent introduction to the TOGAF framework, but it also equips students with a number of digital learning tools to help them along. We focus on delivering engaging online learning assets, such as gamified quizzes, motion graphics and interactive videos. This helps to keep learners interested, and we also provide 24/7 tutor support in case they struggle with anything covered in the course. Once they are ready to gain their TOGAF Foundation certification, students can also request FREE exam vouchers from our team. Students who are interested in pursuing a full TOGAF certification also have the option of taking our TOGAF Certified course, which covers levels 1 & 2. Our TOGAF Awareness course can give unfamiliar students a solid picture of the framework, while our TOGAF Essentials 2018 course can help certified TOGAF practitioners to bridge their knowledge from TOGAF 9.1 to 9.2, updating their certifications in line with the latest version of the framework. Can’t find a course in our enterprise architecture portfolio which suits your needs? We can also create fully bespoke courses built around your own unique learning requirements and KPIs.